Palace XI: Hennessey, Ward, Dann, Delaney, Souare, Zaha, Cabaye, Jedinak, Puncheon, Bolasie, Gayle. That's it - no more live updates to come from here. Crystal Palace manager Alan Pardew: "I would have taken four points from these last two games..but wow, we should have won. "Although I'm frustrated, I'm pleased with another good performance. I want my offensive players to be a bit hotter, but I'm pleased with two clean sheets. "That point is crucial, as I don't think those bottom three can catch us now." More from Everton boss Roberto Martinez, as he discusses James McCarthy's sending off on 50 minutes. "When I saw it live I thought it was a yellow. "But when you watch it on replay, it's the opposite. I think Yannick Bolasie comes across James. His body cannot disappear. I think the Palace player looks for it." Everton manager Roberto Martinez: "It was a more than decent result. "It's always difficult to cope with direct play. When you do that with 10 men, it is incredibly positive. "The resilience and hard work, to be able to be so solid, was great. We had as many chances. Joel Robles had to be at his best but it was a level game. To play like that with 10 men, it was incredibly satisfying." Everton full-back Seamus Coleman has been talking to the media after his side's 0-0 draw. A point's not ideal, he admitted, but better than nothing. He also said he can see why the fans might not be best pleased after a run of four games without a win. "We feel the fans' frustrations but we wanted to put on a performance we were proud of. We still have something to go for this season. We have to stick together." Now now, Nick. It's not all about goals, you know. That's that then. No goals, one sending off. Ross Barkley went close for the visitors in the second half when his rasping shot came off the crossbar. In the end, Everton did well to contain a plucky Palace side with only 10 men. Errr...Pape Souare has a throw-in but has no Palace team-mates to throw to. Not ideal. When it's eventually taken, Everton defender Ramiro Funes Mori feeds back to his own keeper, but gets a bit too much on it and Joel Robles has to work hard to make sure he's got it covered. Jason Puncheon swings a 35-yard free-kick over the top but it's caught by keeper Joel Robles. Palace retain possession and Pape Souare has a go from inside the box, but again Robles gets his paws on it. It's pretty quiet at Selhurst Park now. There's a few chants ringing around from an ardent section of fans, but not much else. ...but the crowd soon liven up when Yohan Cabaye is tripped by Gareth Barry. Free-kick given to Palace, yellow card shown to Barry. Jason Puncheon weaves his way into the area and sends the ball in from the right. It meets Emmanuel Adebayor's head but he can't direct it on target. Can't help but think the Palace striker's heavy dreadlocks hindered him there. Mile Jedinak floats a speculative ball over the penalty area and it comes off an Everton body and out for Palace's 10th corner of the game...which comes to nothing. A late change for Everton as Ross Barkley comes off and Kevin Mirallas enters the field. He'll get a cheeky five minutes at Selhurst Park. A burst of pace from Ross Barkley. He bullies his way through the Palace defence but can't get the final touch. Team-mate Ramiro Funes Mori then comes rushing forward and his long-range effort is stopped, albeit awkwardly, by keeper Wayne Hennessey. Emmanuel Adebayor turns his man in the penalty box but he can't quite make a shot and it's cleared by Everton. Adebayor then feeds to Connor Wickham and Joel Robles gets down low to deny him with his legs. Everton on the charge forward now and earn a corner. Leighton Baines swings it in, it's cleared, and now Palace head up field. Everton defender John Stones tangles with Jason Puncheon, but the latter is then pulled up by the referee for an early body clash with Ramiro Funes Mori. 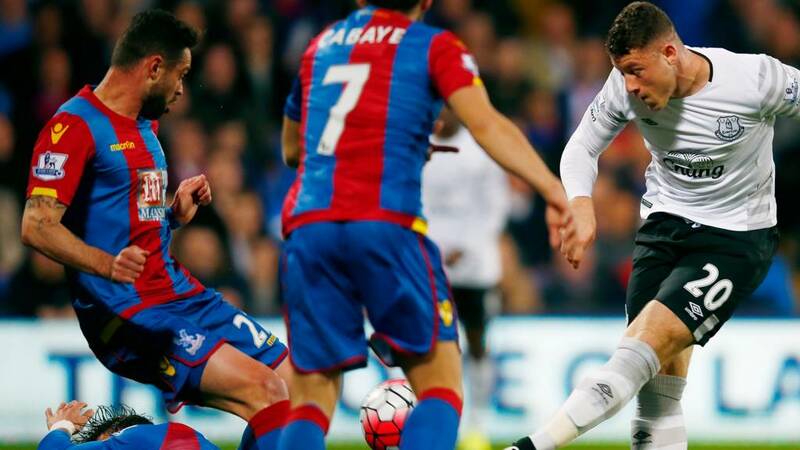 Yohan Cabaye almost on the end of an Emmanuel Adebayor poke, but it's thumped clear by Ramiro Funes Mori. Palace make their third substitution as Bakary Sako replaces Wilfried Zaha. Roberto Martinez is having a word with his Everton players from his technical area. I'm not very good at reading body language , so I won't try and decipher his actions, but I imagine it's along the lines of "don't concede, please." Emmanuel Adebayor, on as a Palace substitute, heads down wards from close range and it trickles just past the far post. Everton may have to cling on to this one. They're struggling to get forward now they're a man down. Aaron Lennon is replaced by Bryan Orviedo, as Palace continue to push Everton's defence to the max. A third consecutive corner is fed in and Wilfried Zaha twists and turns before sending it out wide, and Gareth Barry clears the danger. Everton are camped in their own penalty area now and keeper Joel Robles is on high alert. Lovely bit of skill from Jason Puncheon as he weaves his way past Ramiro Funes Mori and goes for goal, but Robles saves well.